Rabbi Jeffrey Myers of the Tree of Life/Or L’Simcha Congregation in Pittsburgh, Monday, Oct. 29, 2018. The first time I went to Tree of Life synagogue this year, it was to say a prayer for the dead. It was February, a week after I had moved back to Pittsburgh from Brooklyn, and my mother requested that I accompany her to show support. We were at temple for the customary morning service, shacharit, and when the time came we recited the mourner’s Kaddish, a prayer to memorialize loved ones we have lost, in honor of my stepfather’s father, on the anniversary of his death. My mother picked me up from outside my apartment early in the morning and we drove through my old neighborhood, Squirrel Hill, for the five minutes it took to get to the synagogue. The trip was its own sort of ritual, cataloging the places of my youth and the memories they contained. Blocks away from the synagogue is the kosher pizza place I ordered falafel from once a week, the ceramic-filled Judaica store where my mother and I bought my first and only set of tefillin, the alley where my friends and I smoked pot in high school, scattering whenever we heard cops were coming up the street. This is the meaning of home: the reflex of memory. My stepfather, the executive director of the synagogue, was already there when my mother and I arrived. We were helping to complete a minyan, a gathering of at least 10 worshippers, so that the morning services could begin. I shrouded myself in a prayer shawl, and with the scant congregation there in the early hours of a weekday, we began, reciting prayers in Hebrew with a fluid roteness, a language made effortless by a collective past. Before the service began, I was given an aliyah—a call to receive a blessing in front of the congregation as the Torah portion is read, my Hebrew name recited as a summons. I walked down the aisle to the bimah, the pulpit, and faced the congregants as the portion was read, chanted in a lilting minor key. This is the place where I saw my stepfather marry my mother, where my stepbrothers had their Bar Mitzvahs, cracking their voices on the trope of their haftorahs. It is the bimah in the chapel where, eight months later, a shooter carrying an assault rifle would burst through the doors. The members of the congregation who had arrived early would not be facing him—their eyes would be attuned past the place where I stood, facing east, where we’re told a promised land awaits us. Unlike most Jewish communities in the United States, the majority of Pittsburgh’s Jewish population lives within the city limits, creating a shtetl-like atmosphere that our Jewish-European ancestors would find more familiar than not. According to a recent study conducted by researchers from Brandeis University, 26 percent of an estimated 49,200 Jews in the greater Pittsburgh area reside in the traditionally Jewish neighborhood of Squirrel Hill, with an additional 31 percent claiming other urban neighborhoods as home. 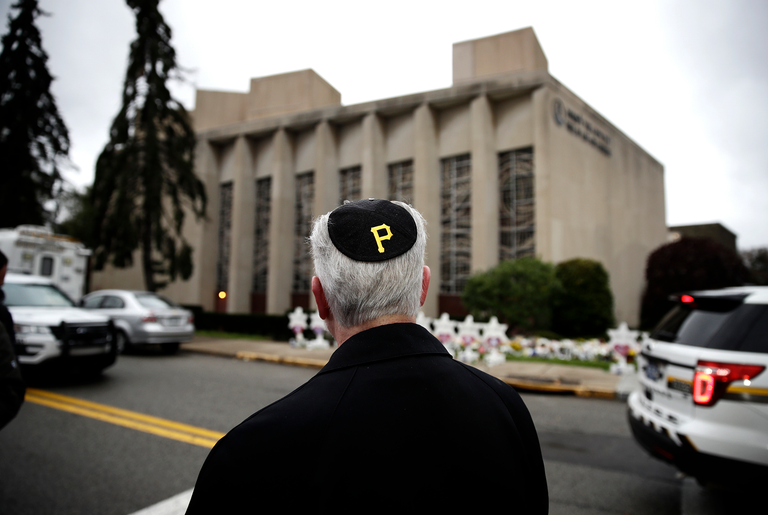 While this same study traced a significant drop in membership rates for local synagogues, a substantial portion of Pittsburgh’s Jews came of age within the hallowed halls of one of the city’s many temples. These places are more than just houses of worship: they are where children run freely through the halls in between Hebrew school classes, rattling around in unoccupied rooms with curiosity and rebellion; where teenagers slow dance at Bar Mitzvah parties, hoping for their first kisses; where adults beat their fists against their breast bones in atonement for their trespasses during Yom Kippur. It’s where my stepfather blows a resounding, primal note on a shofar at the conclusion of every Rosh Hashanah service to usher in a New Year. To say everyone knows everyone is hardly an exaggeration; it’s a given. In the days following the shooting at Tree of Life during a morning Shabbat service on October 27, the fact that we all know each other lends itself a complex and cruel terror. After my partner tells me about the shooting as I’m ironing a shirt, after my mother texts to assure me that she and my stepfather were not in synagogue that day, after my youngest sister and I sob together on the phone, the terrible wondering begins. Michael, the immediate past president of the synagogue, is the father of my first childhood friend. Augie, Tree of Life’s maintenance man, used to come over to our house for dinner on Thursday nights. Cecil, a congregant with Fragile X syndrome who calls my stepfather his “BFF,” visits him every day and confides in him his fears of death. We call friends and family, panic straining our voices, to find out who was where. And as the news reports a rising death toll—first 8 dead, then 10, then 11—there is one undeniable fact: no matter who the victims are, they will be people we know. My father, the son of Holocaust survivors, relays this horrible fact on the phone: that the shooter targeted us because we are Jews, and because we were together. The day after the shooting, I went to a vigil hosted by a local chapter of If Not Now, an activist group I belong to. The organizers made sure to state, with blunt candor, that anti-Semitism is an interlocking symptom of white supremacy, of xenophobia, of a particularly American kind of racist rot. The rain did not deter the candles the crowd holds, flames cradled in our palms. “More cops in shuls will not make us safer,” one speaker said, “Building a wall will not make us safer. Silence will not make us safer.” After each sentence, the crowd agreed. I thought of certain headlines I’ve read, certain declarations, blaming the massacre on the unlocked doors of the synagogue, rather than the shooter or the 21 guns registered to his name; I thought of the president, who blamed the victims by suggesting an armed guard could have saved them. The crowd sang, joining hands, gripping each other, holding each other up. Miles away, my stepfather was curled up in his bed, inconsolable, remembering what Augie told him as he fled from the building: how he saw Cecil Rosenthal, a giant of a man, “just laying in blood,” how he died alongside his brother, David. Another speaker at the vigil, a non-binary trans person, remembered Dr. Jerry Rabinowitz, who made sure to learn their proper pronouns after they began transitioning with the same compassion he showed each of his patients. Daniel Stein, another victim, was their B’nei Mitzvah tutor. A few of us knew the grandson of Rose Mallinger, who was gunned down while attending services with her daughter. She was 97 years old. As the vigil continued, the media reported more details about the shooter, how he earmarked Tree of Life because of the synagogue’s ties to HIAS, a Jewish nonprofit organization that provides aid to immigrants and refugees. One New York Times article quoted friends and neighbors who described him as a man in “his own little world,” a loner who built pipe bombs for fun as a teenager, “a ghost.” He blamed Jews for helping migrant caravans, the same caravans President Donald Trump has incorrectly alleged are filled with “gang members” and criminals. But for now, there we were, this growing crowd of grievers. Once again, we recited a prayer for the dead, our voices in unison. I’ve heard many people say how words cannot express their pain, but in this moment, I find that these ancient words bring hope. Here we are in Pittsburgh, a people. And a people we will continue to be, no matter what may come.